This entry was posted in News on August 9, 2017 by drum. We would like to announce that, as already reported in the Radio Times, the BBC One sitcom Count Arthur Strong is regretfully not going to run to a fourth series. A recent BBC announcement stated: “There are no current plans for a further series of Count Arthur Strong on the BBC’. Series co-creator Graham Linehan took to Twitter to thank the BBC Comedy department for their support but also noted that it was difficult to impossible for any series to establish without the support of repeats. On seeing the announcement on Twitter the Count Arthur fans took to social media to voice their surprise and disappointment, even setting up a Change.org petition which clocked up thousands of signatures in the first 24 hours. The show, written by the characters creator Steve Delaney and Graham Linehan, first aired on BBC Two in 2013 was instantly recommissioned and transferred to BBC One. The second series, aired in summer 2015 (with its transmission run unfortunately interrupted by that year’s general election), drew around 1.2m viewers in 10:35pm slot. Production on a third series was completed in the Autumn of 2016 and the show finally aired in May 2017 in the 8:30pm Friday night slot. The series opened to wide critical acclaim, however, broadcasts halted after two episodes with the snap election resulting in a two week break. Further transmission changes included the penultimate episode being moved to BBC Two due to Wimbledon coverage and series three ended up drawing a similar audience to series two. 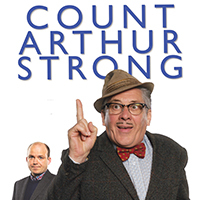 Having set out in partnership with Steve Delaney in 2002 with the main objective of creating a Count Arthur Strong TV sitcom, Komedia Entertainment are thankful to the BBC for their support of the character and to their production partners in realising the creation of 20 high quality episodes which will be enjoyed by existing fans and discovered by new ones for years to come. The three series were co-produced by Komedia Entertainment and Retort TV and the most recent series has just been released on DVD by Network.